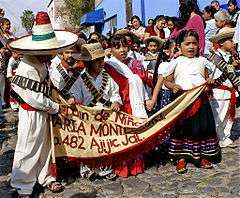 Children from the Montessori Kindergarten singing "La Cucaracha"
Revolution Day is celebrated annually in Mexico on 20 November, marking the start of what became the Mexican Revolution. Until 2006 and again from 2009 to 2013 the national celebrations were located at the Zocalo in Mexico City. Given the recent political and national tragedies that happened in 2014 the parades were called off at the aftermath of the 2014 Iguala mass kidnapping, the biggest national tragedy to date (this was the case also in 2015), and the celebrations happened in the Campo Marte in the capital, thus pushing the national parade up to November 23, Navy Day, with only Mexican Navy personnel in attendance. Thus the national November 20 parades have now been replaced by state level ones, which have been held in major cities all over the nation as per tradition, but in a reduced basis, given recent cancellations due to protest actions on the said date in several state capitals. Article 74 of the Mexican labor law (Ley Federal del Trabajo) provides that the third Monday of November (regardless the date) will be the official Day of the Revolution holiday in Mexico. This was a modification of the law made in 2005, effective since 2006; before then, it was November 20 regardless of the day, and all schools gave extended holidays if the day was a Tuesday or Thursday. Revolution Day — in other countries. Estadio de Béisbol Veinte de Noviembre — baseball stadium in San Luis Potosí, named after this holiday. ↑ "Holidays in Mexico - Focus on Mexico". Retrieved 30 June 2011. ↑ "Revolution Day - 20 de Noviembre - Día de la Revolución". Retrieved 30 June 2011. ↑ "November 20 Mexico Revolution Day Dia de la Revolución". Retrieved 30 June 2011. ↑ "Revolución Mexicana - Días festivos y celebraciones en México" (in Spanish). Retrieved 30 June 2011. ↑ Talavera Franco, Ramón. "LA REVOLUCION MEXICANA" (in Spanish). Retrieved 30 June 2011.